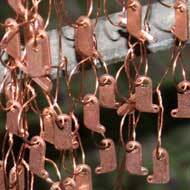 Copper plating is the process of electrolytically depositing a layer of copper. Copper does, however, readily oxidize, so copper plated parts that are intended to be decorative are often lacquered after plating to retain a bright and shiny appearance. Copper is utilized in electronic components and equipment because of its excellent electrical and thermal conductivity as well as its relatively low cost. Highly alkaline baths that are primarily cyanide based. Mildly alkaline baths that are usually pyrophosphate based. Acid baths that are typically sulfate or fluoroborate based. The choice of which copper plating bath to use is dependent upon many factors, deposition rate, operating current density range over which superior deposits can be obtained, throwing power and resultant grain size being some properties that affect the choice. 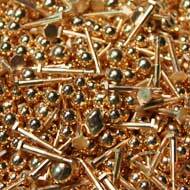 All types of copper electroplating baths require additives to achieve the desired results. Alkaline cyanide baths are the most widely used formulations because of their overall greater throwing power and ability to plate steel and zinc components without worrying about an inferior immersion copper deposition occurring. Mild alkaline pyrophosphate baths have found widespread use in the plating of circuit boards where the same thickness of copper can be deposited on the walls of a through hole as on the surface. Pyrophosphate bath rinses waters are less corrosive than acid baths and are easier to waste treat than any other copper plating process. Acid baths are generally used for decorative purposes because they can produce very bright as-deposited results. The plated parts are then lacquered or clear coated to prevent oxidation. Acid baths are also used for plating plastic parts and for plating circuit boards at high speeds. Copper deposits are less likely to have pinholes or other defects, resulting in an improved final finish. As a base layer under nickel or chromium, copper plating improves adhesion of the final deposit to the part. Copper provides an especially good undercoat for aluminum parts, because most other metal deposits will simply not adhere to aluminum. Hi-Tech Plating ensures the highest quality results by plating copper in accordance with MIL-C-14550 and ASTM-B-734 specifications and by being ISO9000 and NADCAP certified. The first copper ornament has been dated to 8700 BC. China, Chile and Japan are the largest producers of copper. It is believed that policemen are called cops because at one point their uniforms had copper buttons. The initial slang term "coppers" was shortened to "cops" over time. Copper makes beer taste better. Fermenting beer has the undesirable side effect of producing Hydrogen Sulfide (the rotten egg smell), which we can taste in very small quantities. Processing beer through copper eliminates Hydrogen Sulfide. Copper is widely used as an agricultural poison. The "Ice Man" who was trapped in a glacier around 3100 BC carried a copper axe and had high levels of arsenic in his hair, meaning that he was probably involved with copper smelting. Note: the base material on these parts was not suitable for hot tin dipping so a base layer of copper plating was applied.